Batman and Wonder Woman appear on the Robot Chicken variant cover. Cover- Dr. Fate lays on the floor, defeated on the ground. The helmet of fate is above him cracked and seething with power. Fate’s costume also has the constellations on the dark portions of the costume. The dynamic colours really elevate this cover from average status. Story- Evil Superman chops off Damage’s arm and continues to defeat the world army. All of this is monitored by Jimmy Olsen. The team bickers among themselves. On Amazonia General Khan tries to rally what remains of his army, less than one hundred thousand of the original ten million. The space ark is launched in hopes of saving humanity in case they lose earth. Evil Superman destroys it and thus ending all hope of colonizing a planet other than Earth. Khan contacts Atlantis but Aquawoman refuses. Olsen tries to broker an alliance between the two. Mr. Terrific and Sloan are being used by Desaad to build a giant boom tube to take Earth to Bedlam. Bedlam learns of Val Zod and reports it to Evil Superman. 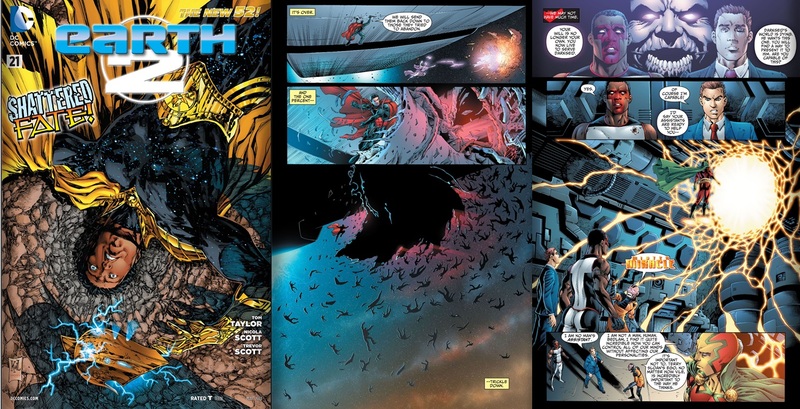 Black Heroes– Hawkgirl, Mister Terrific and Val Zod are all here and accounted for. Action– Not a whole lot happened in this issue but the small skirmish at the end was pretty cool. 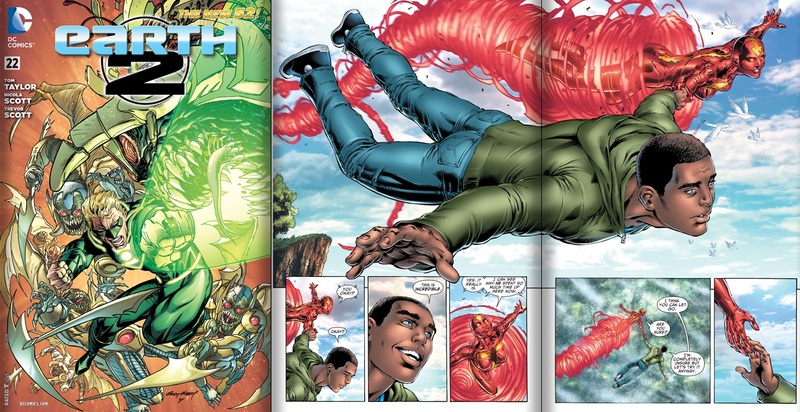 Story– On Earth Alan Scott is reborn. Elsewhere the heroes try to make sense of the cryptic messages of “Dr. Fate”. Louis/Red Tornado and Hawkgirl take Val Zod out for training. Evil Superman and his parademons descend on the trio. Before Val Zod can be killed Louis grabs Evil Superman’s attention by revealing her identity. Art- This is one of the best drawn books on the shelves bar none. The scene involving Louis teaching Val Zod to fly immediately brought back memories of the classic Christopher Reeve’s flight scene from Superman where he takes Louis for a fly. It’s a power moment where the unbridled joy of flight is perfectly captured. Characterization- We learn more about our dark skinned Kryptonian this issue. His full name is Val Zod. He left Krypton before it was destroyed but his ship arrived long after (Learn all about Val-Zod here). Val is the innocence of classic pre-crisis superman personified. For a long time I hated that characterization but considering how “angry” and “vengeful” recent iterations have been (Evil superman in this book, Injustice gods among us version, superman prime etc) this throwback approach is a breath of fresh air. Diversity- Latina Hawkgirl, black superman, android Louis Lane, Mexican Dr. Fate and a whole host of white dudes one actually gay? Yeah no other DC Comics book is doing diversity on this scale and as organically. Kudso Earth 2 team! The Cover was weak. It looks like a discarded interior page as a weak finish. Where are the bold and dynamic colors we have gotten so accustomed to? ← New Details on Storm's Ongoing Series! The new Dr. Fate’s name is Khalid Ben-Hassin. I believe he is middle eastern. (Facepalm) remind me to correct that later! Me and you Keevin! JL is weak as hell compared to Earth 2.